Representatives from Bentson Copple & Associates have lectured to various orthodontic societies, study clubs, orthodontic residency programs, state and national associations, and resident functions. Drawing from many years of experience, we present information that is current, accurate, and useful for any orthodontist regardless of his or her career phase. Our representatives have received wonderful feedback and welcome any future opportunity to educate. For presentations of other lengths of time and honorarium fees, please contact our office for additional information. At Bentson Copple & Associates, we're proud to have some of the brightest minds in the orthodontic industry on our team. Our experts are always willing to share meaningful knowledge, with customized presentations. 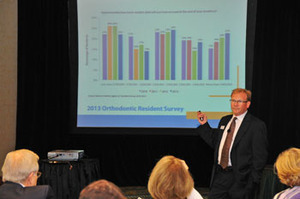 Thank you so much for your presentation to the residents at Georgia School of Orthodontics. Shannon Patterson's presentation was outstanding and it received rave reviews. I don't think our residents often realize how fortunate we are to have such world-class speakers come and share their knowledge with them. As most have never been in another residency, they do not have a good comparison for this program versus others in the country. I want to thank you for your contributions to the practice management course our college recently provided for orthodontic and endodontic residents. Because of the efforts from professionals like you, our college is able to continue recruiting outstanding graduate students who will become leaders in their specialty. Thanks for your efforts on behalf of our college and its students. -Patrick M. Lloyd, D.D.S., M.S.